My five-year-old cousin Morgan has wanted to be a princess ever since she was old enough to talk. At the wedding reception, she’s agog: the bride was right there in the bathroom! Morgan circulates among the tables telling everyone she knows in what is presumably intended to be a hushed whisper. 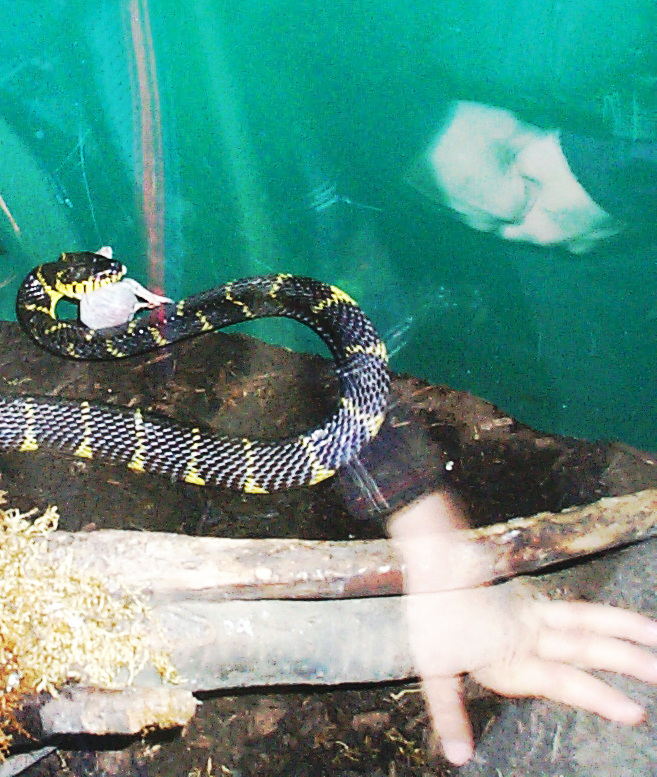 At Clyde Peeling’s Reptiland we get to watch the mangrove viper eat. The keeper removes the back wall of its small green world and dangles a white corpse – a pre-killed mouse – in front of its nose. The trick rope comes alive as quick as lightning. It tries in vain to swallow the mouse tail-first, works it around in its mouth for five minutes until it ends up pointing in the right direction. Then with a sudden gulp, the mouse turns into a lump that makes the blue-black and yellow scales ripple as it moves rapidly toward the stomach. Now the viper can’t stay still: even without legs it paces, impatient for Food #2. When the keeper opens the wall this time, the snake seems ready for larger prey. The mouse does a frantic dance of death at the end of the three-foot tongs. After the viper feeding, Morgan tugs on her mother’s sweatshirt. “Can I have a mouse, too?” Who’d have thought that mealtimes could ever be anything but a dull game played with fork and spoon? They go into the gift shop, and she picks out a plush purple frog with legs as long and bendable as snakes. No tawdry roadside menagerie, the zoo turns out to be a real class act, dedicated to endangered species conservation and environmental education. I can’t decide whether to be pleased or disappointed. No one will ever wrestle with these alligators. We’ll never get to place bets on a match-up between the eyelash viper and the poison arrow frog. I crouch in front of the chameleon exhibit, watching crickets trying to burrow into the bark chips. The chameleon rolls its gun-turret eyes – one at me, the other at a doomed cricket. Adults don’t come to Reptiland, it seems, unless accompanied by children. School groups thunder through like wildebeests. 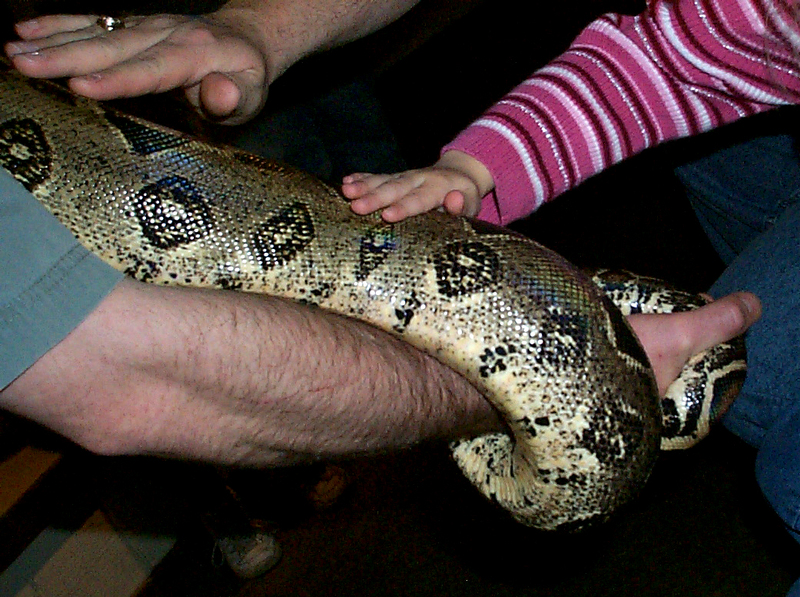 So important to set a good example for the children, we tell ourselves as the handler holds the boa constrictor for everyone to pet. Morgan is delighted. Only one child refuses to touch, mute with terror or intransigence. While everyone around her admires the silky-smooth scales, she stares at the hand clamped over its mouth and keeps her fingers coiled tight against her chest. An outdoor pen contains the only token birds at Reptiland: five emus, to illustrate the link with the dinosaurs. Victorian feather dusters never looked quite so vengeful, but still… “We are not emus!” I say severely as they eye us up. That evening we watch two cartoon movies, the world twice saved from certain cataclysm. Morgan seems bored, starts to wander off. “Sit down, watch the movie, and be good!” her father commands. During the intermission, she finds a dead ladybug in the corner of the living room, sets it on top of a block of wood and pushes it back and forth with her index finger. “Be good, ladybug!” I hear her whispering.